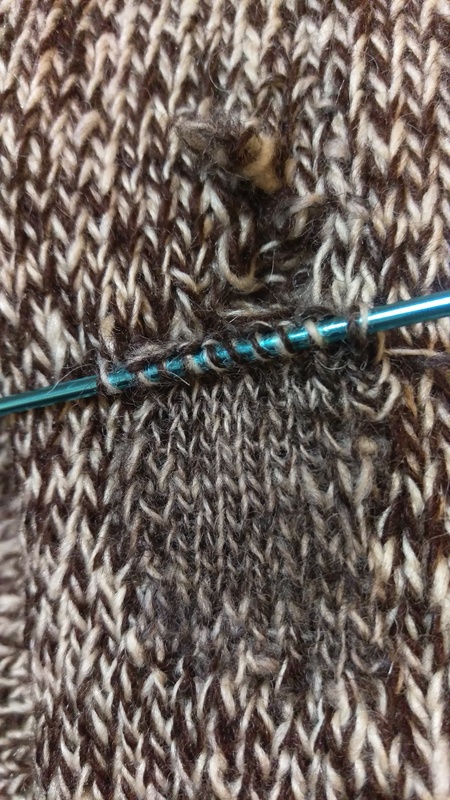 The winter festival of mending continues! I am in a little band, or perhaps it is an ensemble. It’s modest, and it is unlikely to ever achieve fame. But we do rehearse. At one rehearsal the drummer asked me if she could bring me in some knitted things that needed mending to look at. Maybe it was my knitting in periods of waiting that made her ask. The long backstage wait before our one significant gig to date, fro example. I had my sock along, as you might well expect if you have been to this blog before! It’s my usual practice to offer to teach people to mend rather than mending things for them without debate. But she is just so charming. She brought her two garments in the following week and I took them home. 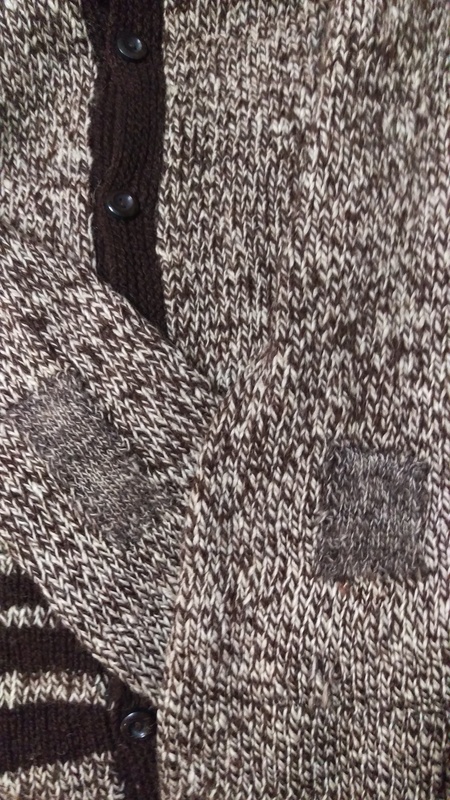 The first is a cardigan which looks to me like a hand spun and hand knit treasure made of relatively coarse wool by contemporary Australian standards. It had already had some mending (above) in a couple of places, and had those signs of long wear–a cuff and hem where the entire edge is on the verge of giving way. I wonder if the drummer knows the knitter and/or spinner? [When I returned the mended item she told me her grandmother had made it but she wasn’t sure whether her grandmother had spun the wool]. The biggest holes were in the elbows. Generously sized and sporting some long ladders in both directions. Happily, the ladders are easy to fix with a crochet hook, so I picked them up, stabilised the edges of the holes and set about knitting up some patches. 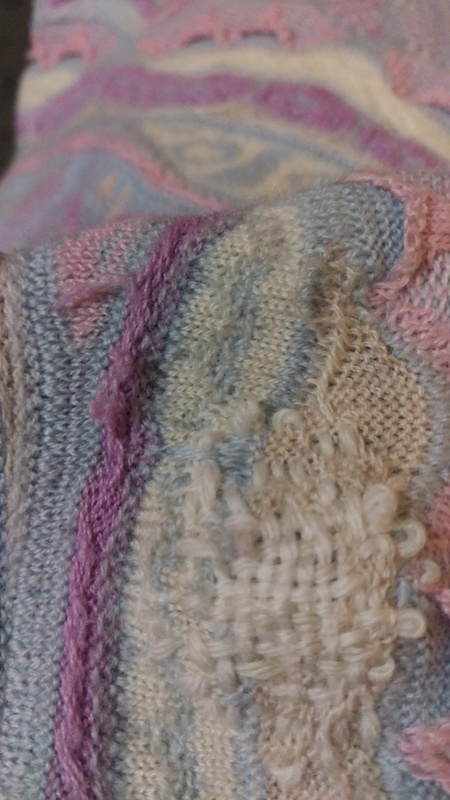 Remarkably, I had some matching wool–same colours, handspun and marled. But not the same gauge. She had said she was up for a visible mend, so I just went ahead and knit some patches in. She will now be able to wear her cardigan again, just as she said she wanted. Next, a merino jumper. It’s a style that is readily recognisable but a little bit complicated to match. 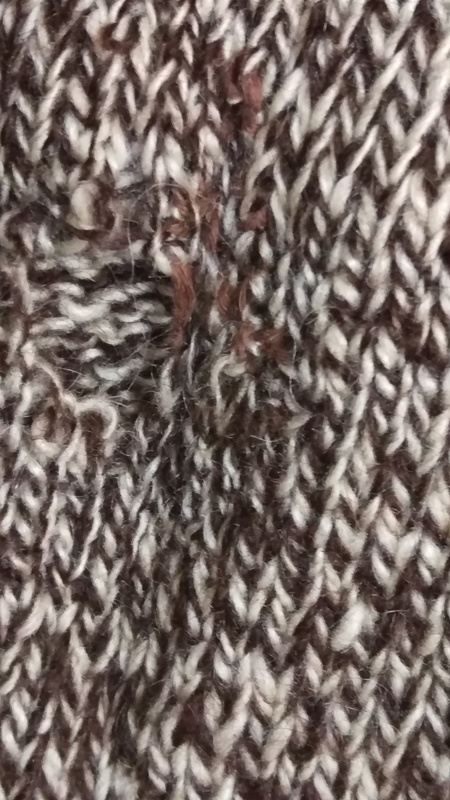 The complex nature of the machine knit had limited the size of the holes, so I tried for a woven mend in something pale enough not to yell out. And lest you think I’m only mending away from home, followed up the next week by darns to the elbows of one of my beloved’s possum wool jackets. These darns show a bit, but not nearly as much as her shirts were showing underneath through what remained of the elbows! Your mending adventures have inspired me. This weekend I spent some time using needle felting to repair my son’s merino thermals. It’s the first time I have tried needle felting so I think I need to refine my technique a bit. But this is the reason I started on the thermals! 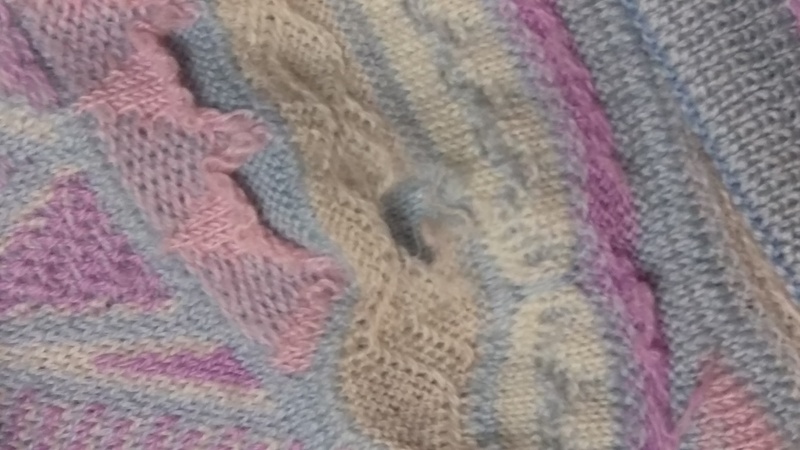 I have hopes of using needlefelting and embroidery to both repair and embelish a beloved cardigan. I love to read about your mending. I have been inspired by Mend it May to restart my tiny mending & alteration business. My first customer went away with her jeans the right length for her. That’s exciting, Norma, and one happy customer already! I am always interested by what it is that people enjoy reading about. I am often surprised by what people find inspiring. But I can’t predict it and have stopped trying to predict it! NICE job on the sweater! She should be very pleased. Tricky with the machine knitted stuff but you did good work. Thank you! 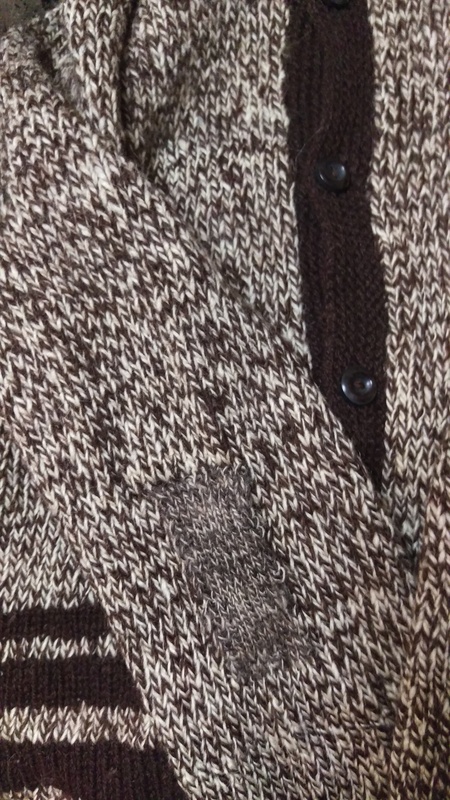 I think the mends on the machine knit jumper will not be noticeable when it is being worn–they are enlarged so you can see them but blend in rather well at life size! I hand them over tonight. In my opinion every meinded item is far more beautiful. also inspire by your mend it in May workshop I no longer feel nervous about mending and have been mending everything. 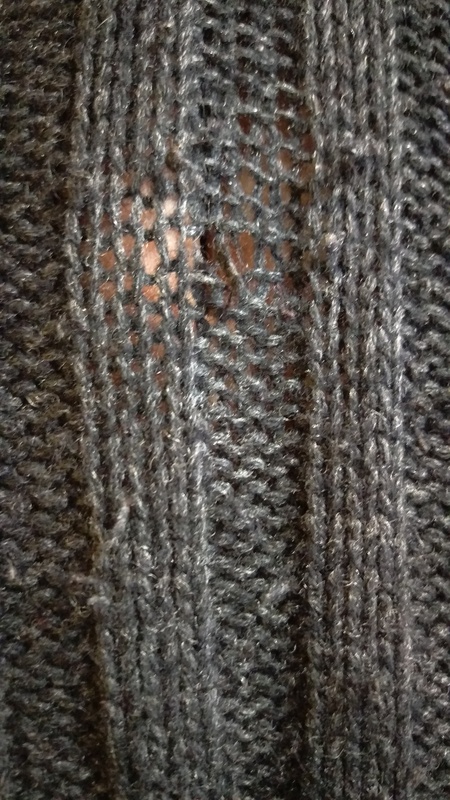 I have a lovely fine grey merino long cardigan that had more holes than fabric (almost) …well about 50 probably which I just used to iron some iron-on mending stiff fabric on the back of. I decided to visibly mend the holes with coloured thread and now it looks fantastic with chain stitched holes and darned holes all over it and has a new much more artistic life. Thank you for your continued inspiration. 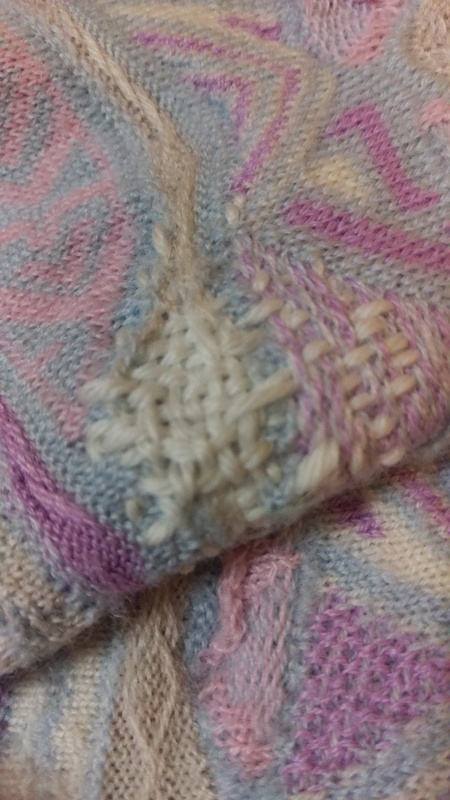 My knitting is pretty atrocious and this blog post has plants a few seeds in my mind of what is possible. Keryn, this is such great news! 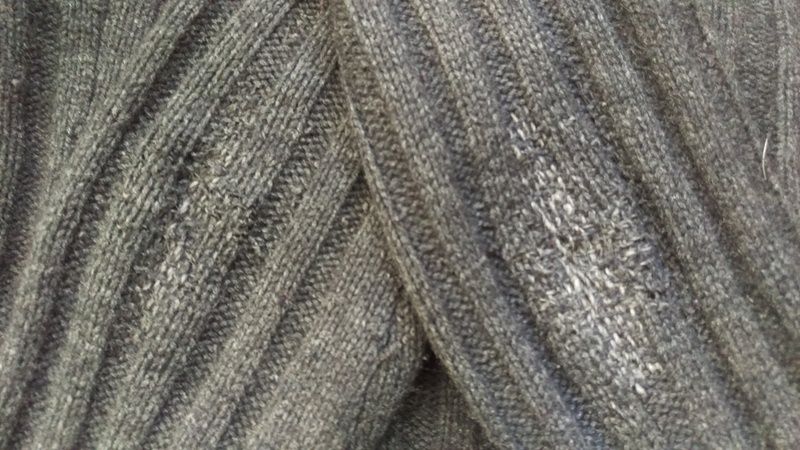 I am sure that your knits will be more beautiful but also much nicer to wear with soft mends on them rather than that iron on stuff (which I have also used in the past but don’t miss!) I am just delighted to be part of enlarging your sense of what is possible…. once my knitting was atrocious too, you know!